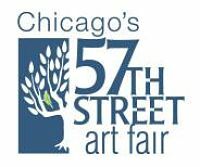 Known as the Midwest's oldest and juried art fair, the 57th Street Art Fair invites artists with high quality, handmade, original work to apply to be part of the 72nd annual juried event in Chicago's Hyde Park neighborhood adjacent to the University of Chicago campus and President Barak Obama's home. The 57th Street Art Fair is a two-day outdoor celebration of the visual arts. Considered the oldest juried art fair in the Midwest, the fair typically features the work of nearly 200 exhibitors. Most are returning artists, but each year between 50 and 75 new exhibitors are invited to participate by a jury made up of collectors, critics, curators and artists. This two day event showcases a range of original work in glass, jewelry, leather, photography, printmaking, painting, sculpture, wood, ceramics and fiber art entirely designed, created and produced by artists from around the country. No reproductions, unlimited editions, or mass-produced works, please. 57th Street Art Fair employs a PR firm November-June to publicize artist involvement via social and traditional media. They secure media coverage throughout every major Chicago outlet and in some national outlets as well.